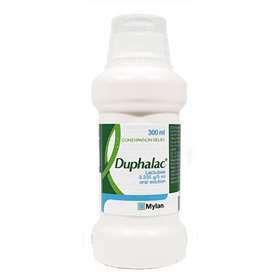 Lactulose Solution 300ml - Gentle relief of constipation for all ages. Lactulose belongs to a group of medicines called osmotic laxatives, which help retain water in the bowels and soften the stools. Lactulose solution encourages normal bowel movement. Children 6-10 years: 10ml twice daily. Children: This solution should not normally be given to infants and smaller children as it can disturb the normal reflexes for passing stools. In special circumstances your Doctor may prescribe Lactulose Oral Solution for a child, infant or Baby. In these cases your Doctor will supervise the treatment carefully. CONSULT A DOCTOR BEFORE TAKING IF YOU ARE DIABETIC OR YOU ARE IN THE FIRST 3 MONTHS OF PREGNANCY. DO NOT TAKE IF YOU ARE LACTOSE INTOLERANT.